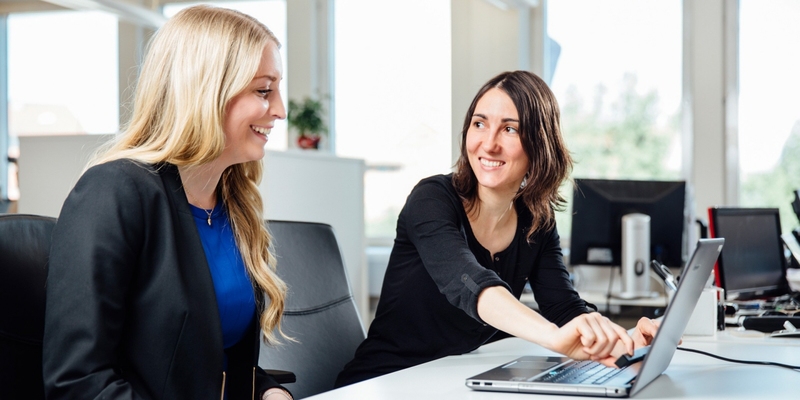 StimTracker by Cedrus® enables you to reliably and accurately time stamp visual, auditory and participant response events with eye tracking data from our Spectrum eye tracking system down to a single millisecond. 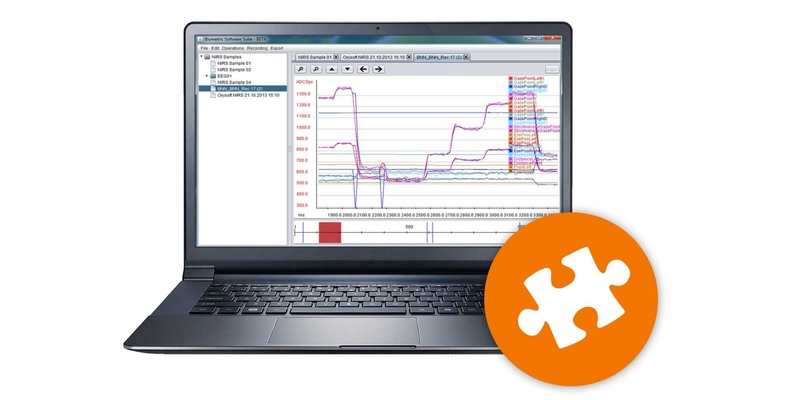 The versatile StimTracker is able to connect to several leading EEG and biometric data collection systems, as well as a PC parallel port. The same events are sent simultaneously to the eye tracker and any other compatible devices, allowing you to synchronize eye tracking data with other data streams with millisecond accuracy. StimTracker provides a reliable and accurate solution to time stamp the onset of screen-based visual stimuli (e.g. images shown in Tobii Pro Lab and eye tracking data from Pro Spectrum) down to a timing accuracy of less than a millisecond. This exceptional timing accuracy benefits studies that require a high temporal resolution, such as reaction time tests and subliminal single-frame stimuli tests. Independent of delays in operating systems, graphic cards, or pixel refresh algorithms, pixel changes on the screen are detected by a light sensor and then sent by StimTracker to Pro Spectrum as event markers. Stimuli changes can then be accessed by users of Pro Lab directly in their eye tracking data, or they can be exported to other analysis programs. In addition to this, any other stimuli presentation or eye tracking recording software that works with our eye tracker through the Tobii Pro SDK can be used. StimTracker provides a versatile solution for synchronizing eye tracking information with other physiological data. This system connects to a range of external EEG products and other biometric data collection systems. 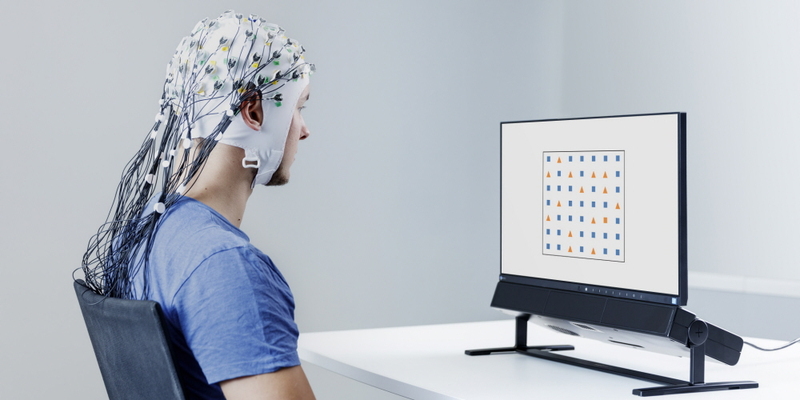 The StimTracker event and EEG data can be synchronized with an estimated timing accuracy of approximately 1 frame rate (1 millisecond for 1 kHz system). The accuracy of the synchronization between the StimTracker event and eye tracking data is independent of the sampling rate of the Pro Spectrum and has a time stamp accuracy of 50 microseconds. The exceptional timing accuracy enables researchers to know exactly where someone looks when certain effects in the human body occur. Saccades, larger micro saccades, and blinks can be detected and, from that information, artifacts in the EEG or other data can be corrected. There are two StimTracker models: Duo and Quad. Both models can send events simultaneously to a Tobii Pro Spectrum eye tracker and another EEG or biometric device compatible with StimTracker (see list below). 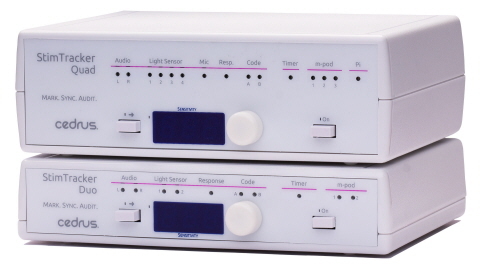 StimTracker Duo can accurately mark the onset of on-screen visual stimuli using a light sensor (up to 2 light sensors), the onset of auditory stimuli, and RB-x40 response pad key presses. StimTracker Quad can, in addition to this, mark the onset of vocal responses from a participant and connect to two further light sensors and to two more EEG or biometric devices. Optionally, an m-pod for any compatible EEG or biometric device that needs to be synchronized with eye tracking data. For more information about StimTracker Duo and Quad and the latest list of compatible manufacturers visit the Cedrus official website. StimTracker is also able to connect to a PC parallel port, and thereby also to PC-based recording systems. 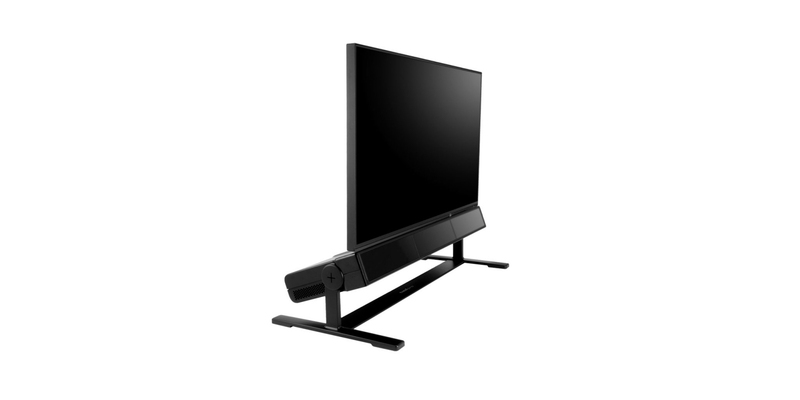 By using an analog light sensor, the StimTracker for Tobii Pro Spectrum provides a fast, robust, and reliable solution to timestamp the onset of visual stimuli. The system is free from any software or timing errors that might occur due to delays in operating systems, graphic cards, or pixel-refresh algorithms. Windows and Linux are not real-time operating systems which can make it difficult to ensure that a picture was shown at an exact time. The StimTracker's light sensor solution overcomes this issue. When a new stimulus is shown, the Cedrus Light Sensor detects a change and generates a TTL binary voltage signal (0 and 5 V). The signal is then transmitted via the StimTracker unit to the Pro Spectrum and the other biometric data collection system. The eye tracker receives the signal, creates an event, and packages it. The StimTracker event is time stamped as soon as the event is detected, independently of the eye tracker sampling rate. The eye tracker sends the data to Pro Lab and the StimTracker event (EyeTracker TTL in) is integrated in the eye tracking recording. Events can then be used to post-synchronize the eye tracking information with the other EEG or biometric system data.